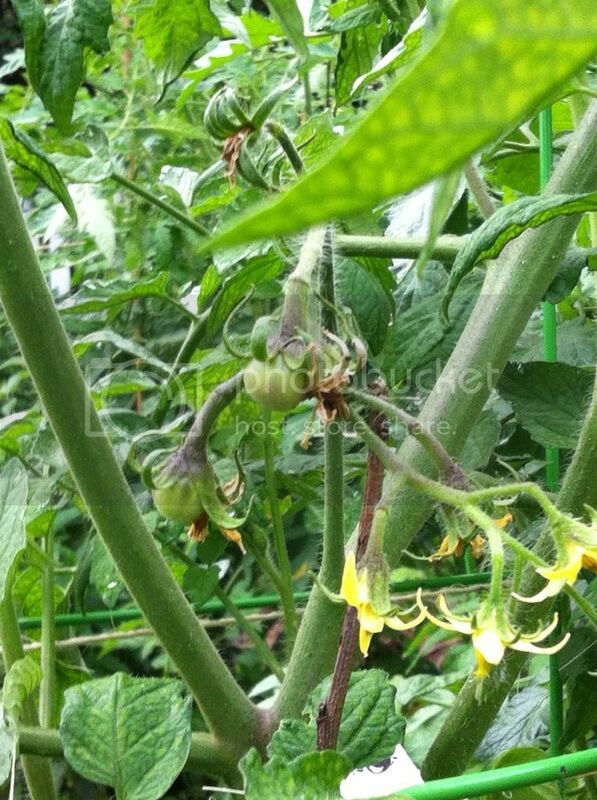 2013 Wild Boar Tomatoes - How are they Growing? 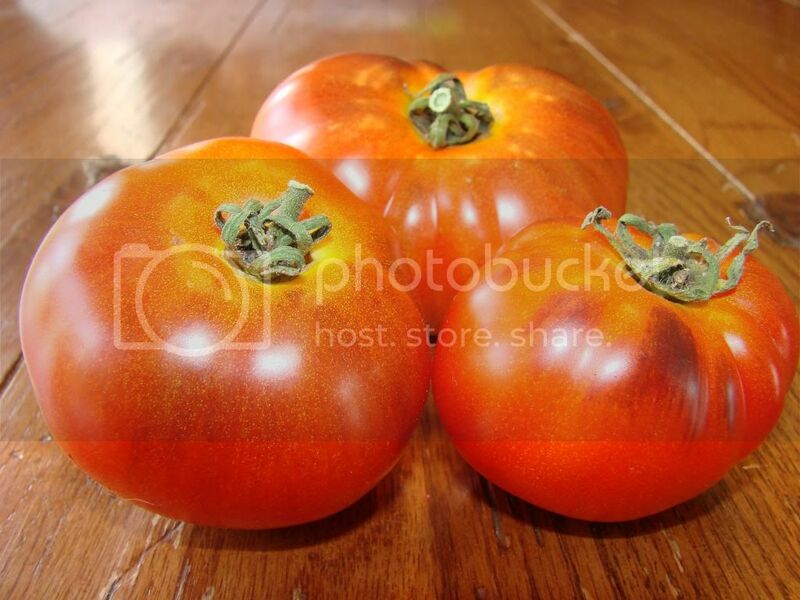 So does anyone have tomatoes from The Giveaway yet? My seedlings got a _really_ slow start, but they're picking up speed right now. My Indigo Apple, Lush Queen, and AAA Solano have been in the ground for about a month, and they're ~18" tall and starting to flower. My Red Furry Boar and Amos Coli went into the ground about two weeks ago, both because they were behind in growth and also because I got busy. They're ~9" tall, but starting to put on some growth. I didn't have space for my Sweet Carneros Pink, so I gave that to my Mom, along with an "extra" IA, and I will be giving my extra Amos Coli and Lush Queen to a friend. 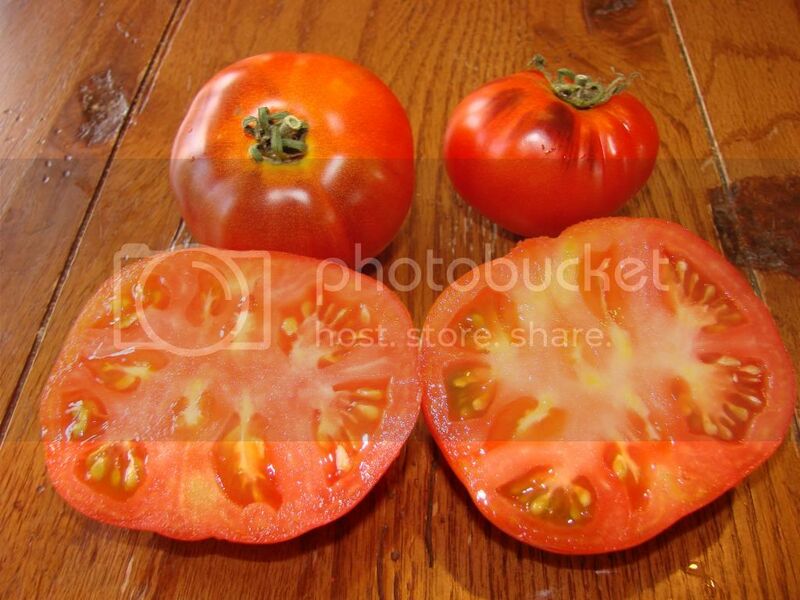 I'd think some of you all would have tomatoes by now! Or is there another thread on this already? I'll try to take some pictures this evening. My Amos Coli's are big brutes. None are flowering yet or anything. Weather's been inconistent on the east coast, hot, freezing, wet, dry. Sometimes seemingly all in the same week! Mid-Late, 6-12oz. Dense, Meaty, Very Beautiful Striped Pink Beefsteak. Good Production, Flavor, Improved Hang-Time, Shelf-Life. Huge production, good Anthocyanin (same thing that makes blueberries blue). Large clusters of 2-4 oz. fruits. 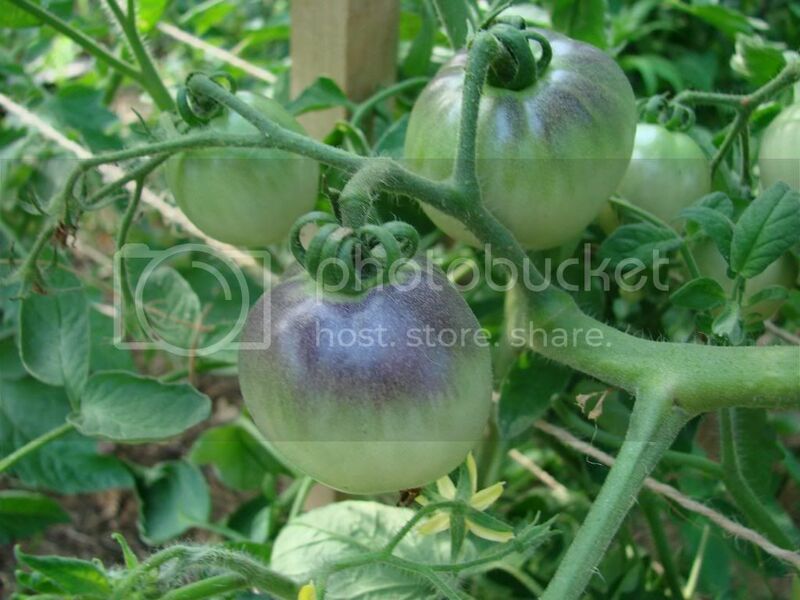 Small unripe fruit turn purple, as they grow and ripen they turn almost black on top where sunlight hits, bottom and interior are red. Fruit has excellent hang on the vine ability. Very ripe fruit has excellent sweet flavor. Crack & sunburn resistance. New Release. Wild Boar only has a limited supply. 2-4 oz. Red with Gold Stripes, Matte Skin, Fuzzy. Great, True Tomato Flavor, peach fuzz skin not at all intrusive. Heavy Producer. Another Great, Rare, Unusual Variety. 120 plants all pure. Mutant discovered in Yellow Boar (Yellow Stripe). Very attractive yellow with green stripes turning deep orange color with gold stripes. Some hang time ability. Stays firm, very sweet with a hint of tropical fruit. Produced huge harvest for 2009. 2 Ã¢â‚¬â€œ 4 OZ. Large Meaty Paste Heirloom. Very Good Production. Dense Meaty with Great Well Balanced Flavor. Great for Fresh Eating, Canning and Sauce. Given to me at the 2012 National Heirloom Exposition in Santa Rosa, CA. Do we know yet if these varieties are determinate or indeterminate? WBF says "indet." for Red Boar , but doesn't say for Indigo Apple, Sweet Carneros Pink, or AAA Sweet Solano, and doesn't list Lush Queen or Amos Coli at all. 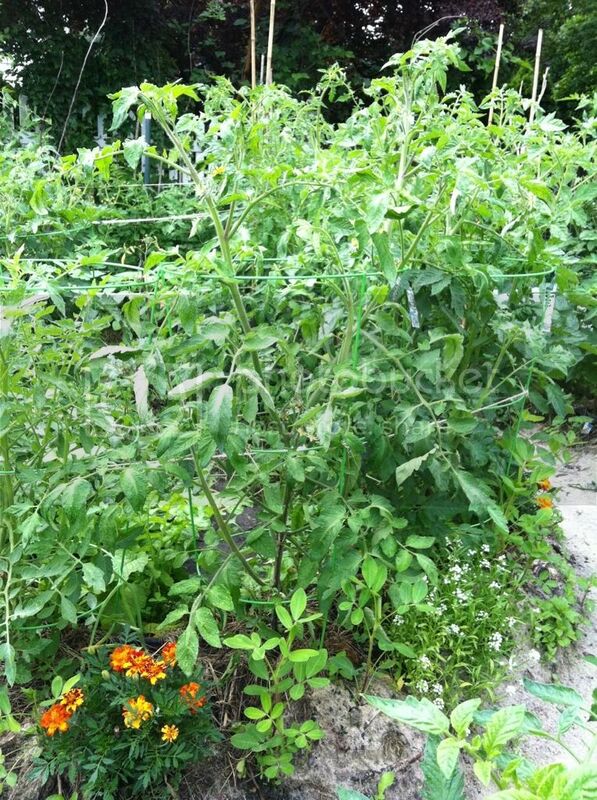 Re: 2013 Wild Boar Tomatoes - How are they Growing? My largest Indigo Apple (about 24") and Amos Coli (about 28") are blooming and close to fruiting, so my estimate on Amos Coli was off, I think. I believe AAA Sweet Solano was closer to Mid than Mid-Late when I grew it before. I was noticing that the dark antho/purple stem color of Indigo Apple has faded as it grew -- still dark near base but regular green higher up perhaps in response to heat, but hopefully will show the "indigo" in the skin of the fruits. I plant to use the "mirror trick" -- maybe use aluminum single serving pie pans or something -- to get sun shining all over the fruits for maximum all over antho/tan effect. The CRW cages are 5' tall. The left most two were transplanted last, and those are Red Furry Boar (back corner) and Amos Coli. The bits on the ground are from today's pruning. Somehow my amos coli didn't make it to the garden. Unless its at my satellite garden. I haven't checked that list. But Indigo apple is doing good. It has several tiny fruit on it. I will get some pics when it is further along. 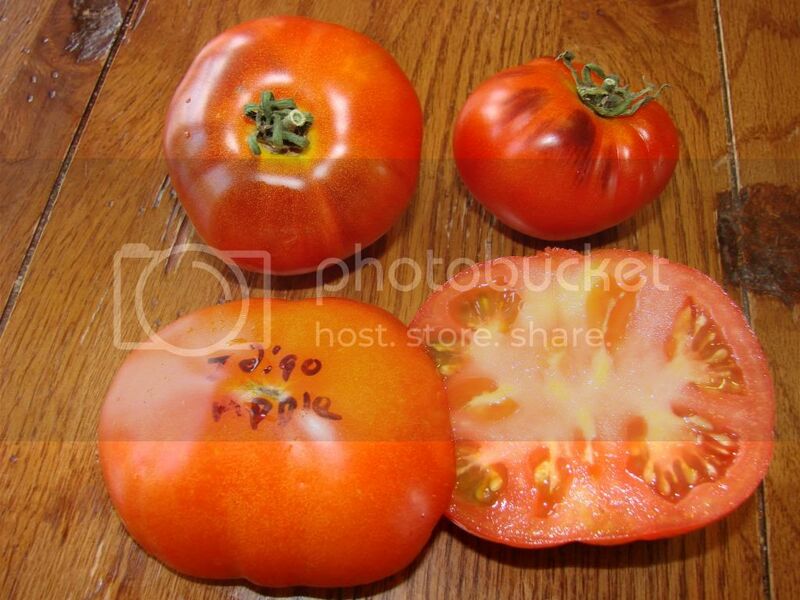 I've also got 4 store-bought varieties, so I have 9 different tomatoes this year. This is way more than I've ever grown before. If they all make tomatoes I'm going to have to buy a basil plant and a buffalo. "Buffalo"? ...to milk and make buffalo milk mozzarella? My indigo Apple like like yours. I will get pics later when they are bigger. I sowed some Amos Coli too but no fruits yet. applestar wrote: "Buffalo"? ...to milk and make buffalo milk mozzarella? Way smaller than an apple, and not very indigo, but it's a start! Took some pics while out tying up and checking on things. Here is Indigo Apple courtesy of Admin courtesy of Brad Gates. Many thanks to both of you. Here's my favorite thing to do with tomatoes. These ones aren't Wild Boar, which is why that's in another thread. Looking good and rather productive I would call it a mid season. But the production looks to be great. Just now starting to get into the groove at early July. Been waiting on this one more to come. 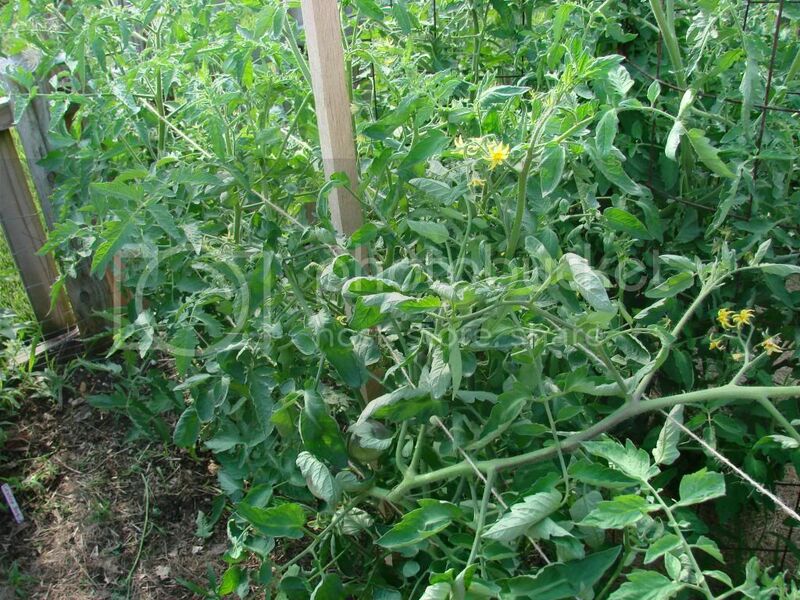 Helpful Gardener Wild Boar Farms Tomato Seed Giveaway! 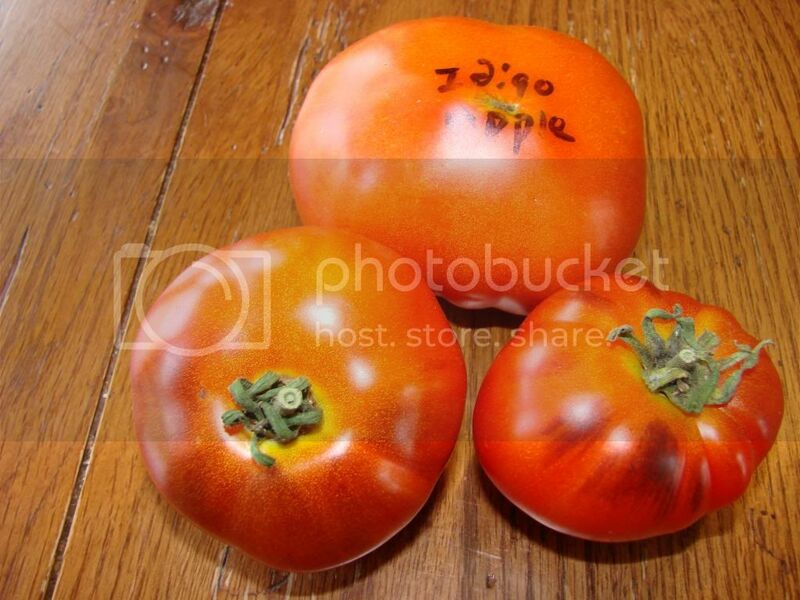 2013-14 WHO'LL BE GROWING WINTER TOMATOES INSIDE THIS YEAR?